Mary Smith awarded IPI 2018 Lifetime Achievement Award! 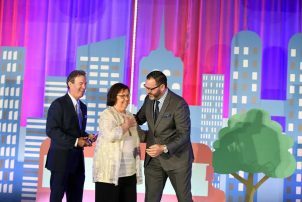 Orlando (June 4, 2018)— Mary Smith of Walker Consultants has been recognized by the International Parking Institute (IPI) with one the parking industry’s highest honors, the 2018 IPI Lifetime Achievement Award. The Senior Director of Parking Consulting for Walker Consultants, Smith is widely recognized across the globe as one of the industry’s most accomplished professionals. Smith’s expertise and creativity can be seen in thousands of parking projects across the United States, Canada, Abu Dhabi, China, Dubai, Egypt, Indonesia, Korea, Kuwait, Qatar, Russia, and Turkey. As co-author of Parking Structures: Planning, Design, Construction, Maintenance, and Repair, the industry’s most important reference and text book, she has also played an instrumental role in the evolution of the modern parking structure. In addition to being an authority on parking design and planning, Smith is also recognized as the industry’s “go-to” person on issues related to vehicle sizes and parking dimensions, parking under the Americans With Disabilities Act (ADA), and compliance with the Manual On Uniform Traffic Control Devices (MUTCD). And with the introduction of self-driving vehicles on the horizon, she has become the acknowledged authority on how SDVs will impact parking planning. Smith was also the author of the Urban Land institute/International Council of Shopping Centers Shared Parking (Second Edition), an equally seminal work in land planning. She is currently co-chair and will be principal author of the updated third edition.